There’s something of a myth that everywhere has to have wheelchair access now because “the law requires it.” In reality, the law (Equality Act, 2010 which replaced various antidiscrimination laws including the Disability Discrimination Act) requires companies and venues to make “reasonable adjustments”. So they can argue there’s no demand for adaptations or it’s too expensive to do so. And in practice it often takes someone arguing for improved access or even the threat of court to get it. The reality of my life as a wheelchair user is that things are a lot more accessible and inclusive than they were when I was a child, but no where near as good as a lot of people think. Lack of awareness and even sheer thoughtlessness also play a part in making things either inaccessible too. There have been many a time when I’ve rung somewhere and explained my needs. Only to arrive and find they forgot to mention the steps or didn’t think they mattered because they were only little. It’s exhausting, demoralising and upsetting. And I don’t know what to say to change it. Just that my main memory of a long ago wedding isn’t how lovely the bride looked but of falling out of my wheelchair on a step in an allegedly accessible venue. That I remember going for a Christmas meal with a group I’m part of and laughing off offers of another drink as me watching my alcohol intake when in reality I knew there disabled loo was not going to fit my wheelchair. And of spending 20minutes getting somewhere in my powerchair only to spend 15 more sitting outside while the people who hired the venue tried to figure out getting me in as a manual could be bumped up the small step but my powerchair couldn’t. I left without attending that meeting. 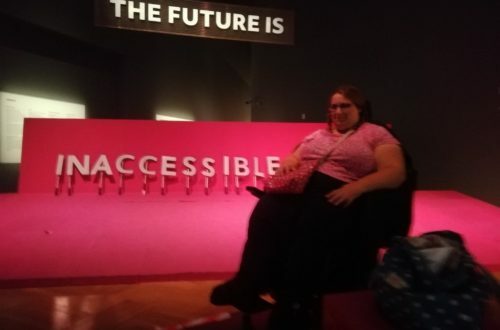 Another thing is that if a provider says their venue is accessible, we assume that it is. So, they get to feel good about being so hip and up to the minute, and when we arrive, we discover all kinds of issues (that are blissfully unapparent to other users) that make a venue inaccessible. Perhaps the thing to do is crawl to the reception desk and sit on the carpet until someone asks what we are doing there. I refuse to get upset about it, or to allow that kind of social blindness to demoralise me, because then, I have lost out twice. And if I fall over – which I do regularly – I hope to make some kind of gain from it, (though what that is, is hard to say.) Perhaps its easier for me because I’m getting older and care less and less what other people might think of me. I don’t give a monkey’s jumper about looking stupid or being awkward, either.